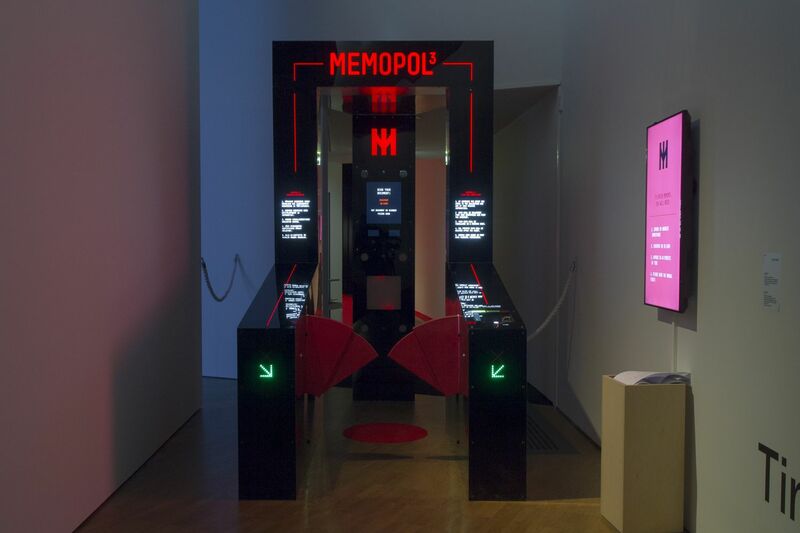 Memopol-3 is an installation that visualizes visitor’s information field. It’s an Orwellian dystopia which is built on the technology of today. The tools of surveillance economy are abused to create a personal physical surveillance experience. Physical and virtual identities are quantified and processed into a stream of data. After the phases of data collection the visitor experiences a transcendent reflection of oneself that combines the past and the future, physical and immaterial into an audio-visual ceremony. 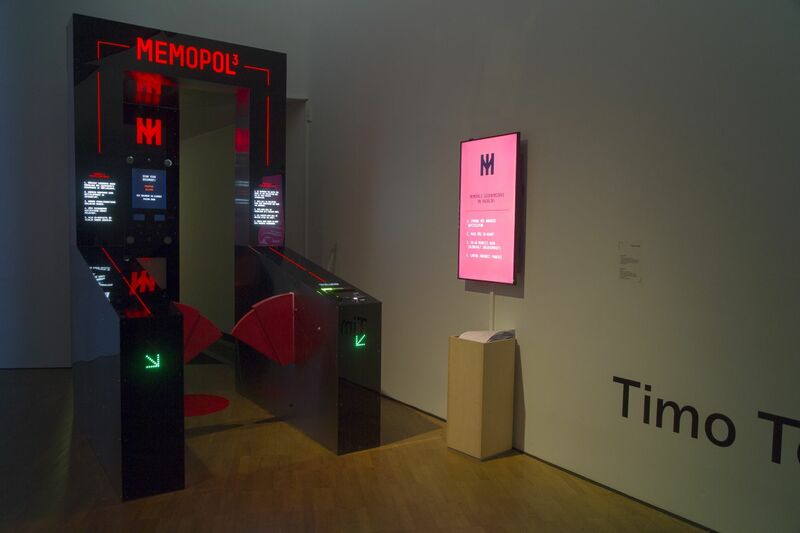 The experience of Memopol-3 starts with the gates where visitors identify themselves with passports or ID-cards. The gate conducts a biometric scan and the visitor is asked to connect their smartphone to the system. All private information stored in the smartphone is copied and analyzed by algorithms and neural networks. Contact lists, messages, call histories, WiFi networks, photos, videos etc are used to create a 10-minute-long animated graph of the visitor’s life. 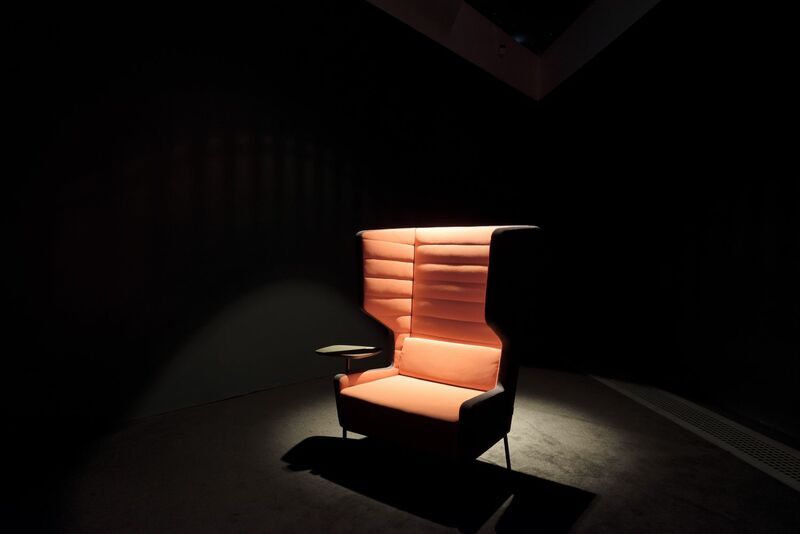 The audio-visual piece is presented privately in a separate room. Relationships, daily behaviors, important life events and photographic memories are viewed from the perspective of a big brother. It has been a wild race towards the unknown future. We have built systems so vast that no human being has overview of. We have dissolved ourselves in the mists of the networks sharing the most intimate details of our lives. We are merging with the information flow as deeply as possible. We have trust in the technology to bring us better tomorrow. We believe in it. We are part of it and it is part of us. In our every day life our actions are constantly being monitored, processed, stored, transferred, sold and bought. But this constant flow of information is hidden from our view. It’s hiding in the shadows of proprietary software on our laptops, Internet of unsecured things, rogue apps on our smartphone. It’s stored deep in the NSA databases, cultivated in the server farms, floating in the cloud. We do have control over our actions, but not over the data it’s generating. We worship this data and give it supreme value. The most valuable companies are the ones that know the most about us. They have constructed the best models of homo sapiens. They know our great abilities as well as the weakest points. They know how to make us addicted, seduced, trustful, happy and sad. They find out our individual deviations to be even better at it. The credo of today’s business is to surveil and serve (ads). To keep this wheel rolling we must have faith. And this is what we are good at. We have great powers as species to imagine something that does not exists. If enough people believe, we keep going. Even when it’s dark sides are exposed we still keep pushing forward not knowing what the future will bring. We are preached by techno visionaries: it will be better than the past. But utopias can exist only in computer models, not in dirty reality. Even with the best models, it’s impossible to calculate the future. We can foresee some paths, but not all of them. We have built these surveillance technologies for our safety and convenience. But what happens in times where everyone are becoming suspects? The tools will be the same, only aimed at everyone. 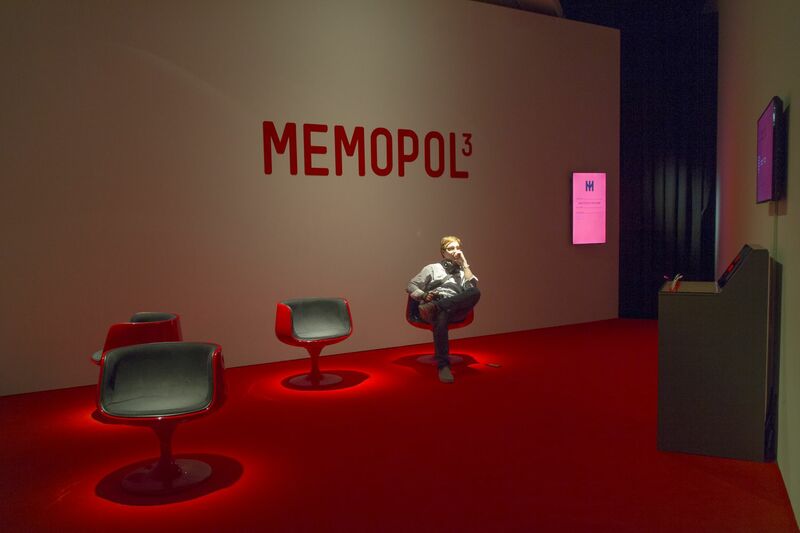 Memopol-3 is an Orwellian dystopia which is built on the technology of today. It’s a total surveillance experience. Your presence will be monitored, actions recorded and your digital devices abused. Your physical and virtual identity will be quantified and processed into a stream of data. After the phases of abuse your will experience a transcendent reflection of yourself that combines past and future, physical and immaterial into an audio-visual ceremony. 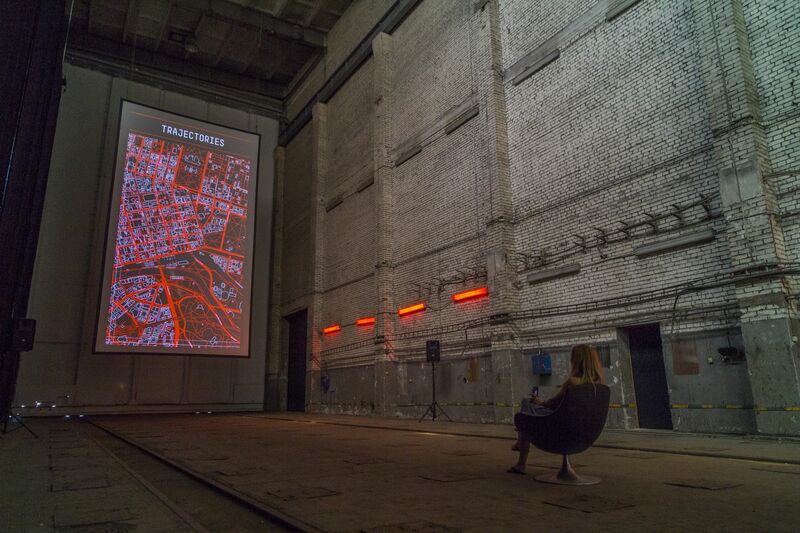 Memopol is an interactive installation that consists of three main parts: the gate, the lobby and dataspace. To have a full experience, the visitor has to go through of all the parts. The visitor is "logged in" in the gate, the data is gathered in the lobby and the visualization is shown in the dataspace. The experience starts already before the visitor enters the gate. The visitor must understand the whole process before entering. The rules on the gate must be accepted which also state what will be done with the data. They have a freedom to choose wether to participate or not. The visitor scans ones national passport or ID-card and the gate opens. The visitor is photographed with cameras and then asked to connect smartphone to MEMOPOL wireless network. The Android users must download an app. Then the visitor is asked to continue to lobby. The lobby is the place where data gathering takes place. Android users just must keep the app running. They have an ability to charge their phone at the smartphone console. The iPhone users must connect their phone to USB cable in the console. The PIN code must be entered and the data collection starts. The installation creates a backup of the whole phone. The visualization is created from the visitor's data and it's shown privately in the dataspace. 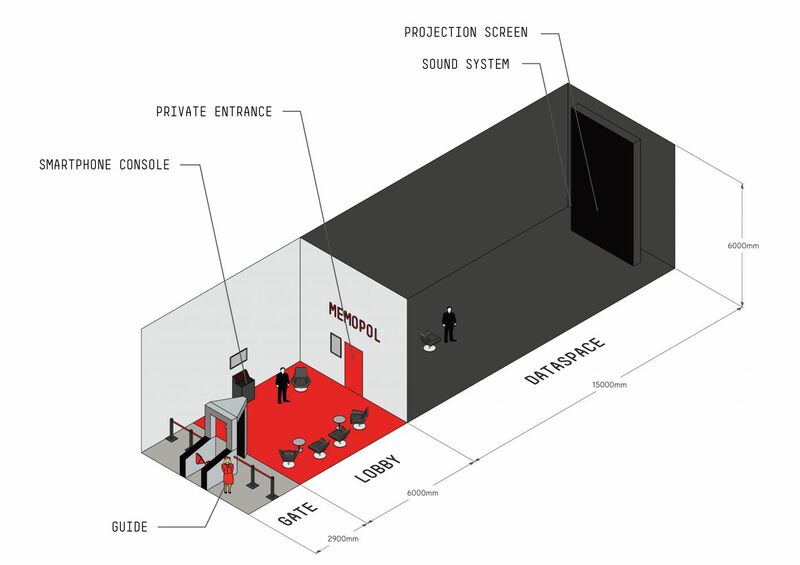 Main features of the dataspace is a large-scale portrait screen and powerful sound system. The animation in the dataspace must be seen only by the subject. Public and private space must be separated by door or curtain. The visitor can invite friends to see the animation as well. The installation does work only with iPhone or Android smartphones. Windows phones, Blackberries and feature phones are not supported. It is required to have a guide near the installation at all times. The guide assists the visitors with technical problems and answers questions about the work. The required dimensions for the installation is variable and it's possible to customize it according to possible spaces. It is required to have two separate rooms for private and public use. The data collecting in the gate and lobby does not reveal any private data (besides name) and could be done publicly. The total visit of the installation varies by multiple factors. The procedures in the gate take around 1 minute. The data collection from the smartphone depends on the manufacturer of the device and the amount of data stored. The maximum durations for the data collection process is 10 minutes for Androids, 20 minutes for iPhones. The visualization in the dataspace takes maximum 10 minutes. In total the minimum visit could be around 25 minutes for Android, 35 minutes for iPhones. As the dataspace is visited privately one by one the queue takes usually the most time. The installation automatically limits the number of concurrent visitors not to create too long queue in the lobby. The data that is collected from the smartphones is sensitive information and the installation treats it like that. All processing takes place in a local server, so no data is transferred outside of the installation space. The visitor has to agree to rules that are clearly stated on the gates in two languages.